Many thanks to Bitter Tea and Mystery and regular blog visitor Kathy D for prompting me to try this series. If you heard of a book set in the relatively recent past (early 1960’s) featuring a farmer’s wife turned reference book indexer who becomes embroiled in a murder investigation you might imagine a typical, amateur sleuth-led cosy mystery. You’d be as wrong as I was. SEE ALSO MURDER is more melancholy than cosy, has one of the most beautifully depicted settings I’ve ever read and introduced me to someone who is destined to be among my favourite fictional characters. Of all time. Farming in North Dakota has never been an easy way of life, and restraint was a necessary quality no matter the season. The winters were hard. The wind was so fierce at times you felt it was going to tear your eyes out. A relentless scream of air raced forever across the flatlands, entered your head like a tapeworm, burrowing deep in your mind, allowing no silence, no peace, unless you knew how to make it for yourself. But there are lots of small little details too which help provide a picture of the isolation, the practical form of the local community’s spirit, the direct impact of weather on every aspect of life. And so much more. Marjorie Trumaine is the novel’s heroine. Even before the book’s crimes takes place she’s doing it tough. Her husband Hank has suffered a traumatic accident which has left him blind and a quadriplegic. It has also left him with a burning desire to be dead, though he’s unable to make this happen himself so sometimes beseeches his wife to kill him. Marjorie misses the physicality of her husband’s presence, the practical things he can no longer do, and mourns the loss of the future the couple had dreamed of. But she doesn’t complain or collapse into a funk. Women like her don’t do that. She had turned to indexing before Hank’s accident – when the farm needed some extra income – but now relies heavily on the work so the family can stay financially afloat. And she loves the work. Really loves the way it allows her to learn about the world beyond her farm and organise things and use her brain in the way her parents always hoped she would. Many years ago I was the designated indexer for the official publications of the organisation I worked for then and I still miss that aspect of that job so I completely identified with Marjorie’s love of the work. But I think I’d have fallen for her anyway. She’s resilient and pragmatic and deals with her foibles, such as her occasional need for a cigarette and a tendency towards plain speaking, as best she can. She also reminds me more than a little of my mum. I haven’t even talked about the story yet and I won’t say too much. Except that it’s excellent too. It begins with the brutal murder of the couple who own the next farm to Marjorie and Hank. The crime horrifies the entire community, not just the Knudsen’s two adult sons. Marjorie becomes involved because the local Sheriff, Hilo Jenkins, asks her to do some research on an amulet that was found at the crime scene. Marjorie, he says, is the smartest woman he knows and he trusts her to get to the bottom of it. She has to do things she doesn’t want to in order to help Hilo – leave Hank in the care of someone else, talk to her cousin Raymond who always puts her down, put aside her current indexing project and risk missing a deadline – but of course she she dives right in. Because she is needed. As is the way of things in crime novels things get worse before they get better and I was literally sitting on the edge of my seat by the end. The resolution, though terribly sad, is fitting. There’s nothing flashy about SEE ALSO MURDER. It’s cover is not particularly eye-catching and it is not accompanied by the hype or buzz words that most books are paired with these days. Indeed it is so unassuming you could easily miss it all together. And that would be your loss. This book is an absolute treat. I read it in a single day and for the last 50 or so pages was torn between desperation to know how everything would be resolved and not wanting my time with Marjorie to be over. I’ll definitely be revisiting North Dakota in the second book of this series. This is the 14th book I’m including in my quest to complete the Reading USA Fiction Challenge in which I’m aiming to read a total of 51 books, one set in each of the USA (and one for the District of Columbia). My personal twist is that all the books are by new (to me) authors. This entry was posted in book review, Larry D. Sweazy, USA. Bookmark the permalink. I’m so glad you liked this book. I haven’t read this one, but read book two in the Marjorie Tremaine series. I felt the same way about the descriptions of the location and the type of life Marjorie is leading and tried to think of myself in her place. That was difficult, as I have no frame of reference for type of life. Also, I really liked Marjorie, too, as a strong, determined, smart woman who plows through and gets things done without self-pity or letting fear stop her. She is in contrast to a lot of women characters I have been reading about recently, often wanting to throw books against a wall. Doesn’t anyone have backbone and resilience any more? Do what they have to do out of duty and responsibility? Act like an adult when confronted with difficulties? Yes. Marjorie Tremaine is my kind of hero. See Also Deception, book two, will not disappoint. And I’ve read that book three, which should be out next year, will take Marjorie to New York City. While that won’t be an eye-opened for me in terms of the environment, I want to see what Marjorie does and thinks here. I keep hearing such great things about this series, Bernadette. First from Tracy and Kathy, and now from you. I think it’s a Sign that I really ought to try it. I do like the setting; the snippet you shared and those I’ve read elsewhere are so authentic. And an indexer – what an interesting idea for a protagonist. Thanks for the reminder that this is out there. You write a great review, Bernadette. And I am so glad you liked this book. 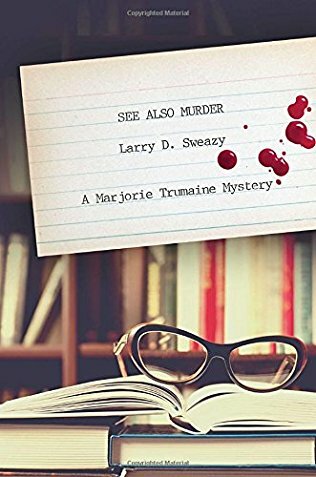 I was also impressed by Marjorie’s character, and I loved the indexing aspect. And yes, Margot should try this book. Count me in as another fan of this book – I have a copy of the second in the series and am looking forward to it.